How do I search for `!` (exclamation mark) in a manual page? I want to get the explanation for ! 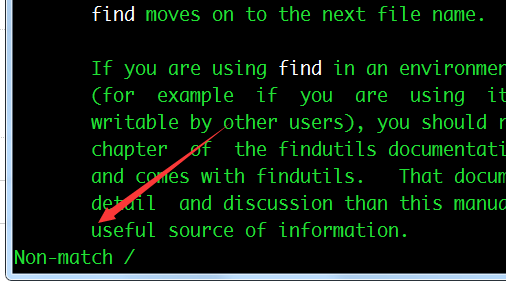 option (which means exclude) in find command in the man find. And then I press / and shift + 1 , a Non-match popped out, instead of ! So my question is how to search for ! in a manpage? the -a and -j options, which change this). Search for lines which do NOT match the pattern. So, a pattern of just ! is an empty pattern (which matches anything) negated - so nothing will match it. You'll have to escape the significance of ! at the start of a pattern, by either using a backslash (\! ), or otherwise making it not the first character of the regex (/[! ], for example). $ man find | grep ! /111 and ! -perm /a+x respectively). You need to type \ before you type !, so that it will not be interpreted as a negation regular expression in search. After the manpage opens in firefox, press CTRL + F to search for any character. Not the answer you're looking for? Browse other questions tagged documentation manpage or ask your own question. How to get paragraph for certain option of command right away? How do I decide which manpage to use on the Ubuntu Manuals site? What does man page for pmap look like on 12.04? Do man pages for the same command differ depending on source? Are any other systems' manpages available on Ubuntu? How to search for all the man files that contain certain keyword? How to skip to a particular option in man pages?